Genoa is a very important city port in Northern Italy in the region of Liguria. If you have never heard about it before then maybe you will be more familiar with Pesto Genovese. It is here where this style of making pesto originated. Aside from it's popular cuisine, we wanted to visit Genoa for its history. In the middle-ages and renaissance it was a main rival of the maritime kingdom of Venice. Any rival of Venice is worth at least a weekend in my travel agenda. Christopher Colombus (you know that guy who sailed to India but arrived in the Americas) is also a native of Genoa. Genoa felt more like a little Napoli than a rival of Venice. It's "carugio" really reminded me of Napoli. In the picture above, I really did not understand why they would construct an overpass between the old city and the sea, blocking the view. It is very charming. There is one street just full of abandoned broken-down palaces. (below). It is really not so difficult to imagine how beautiful they used to be. Of course, ensuring my return to this region is the cuisine. 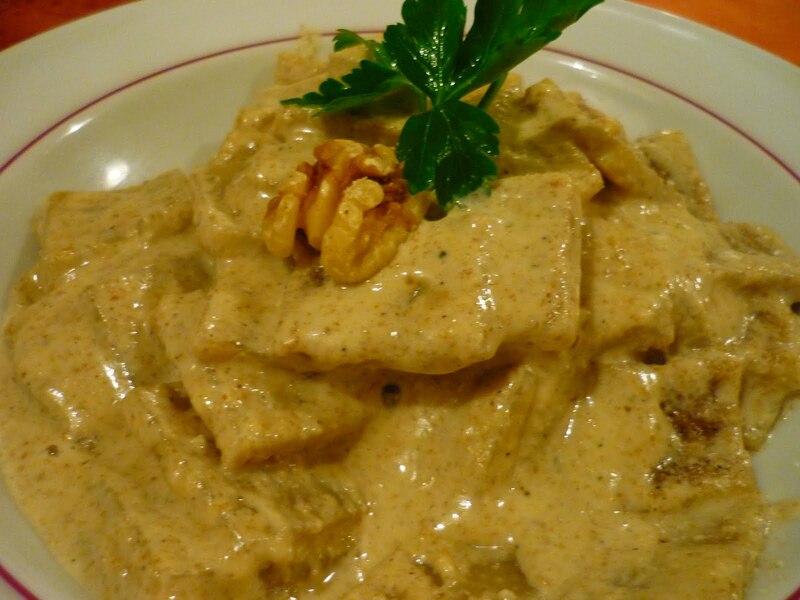 The picture below is a pasta dish with walnut sauce which is one of the dishes we tried at Restaurant Da Gaia (Vico dell'Argento,Genoa).I highly recommend this restaurant if you want to sample typical Ligurian cuisine.Yummy!